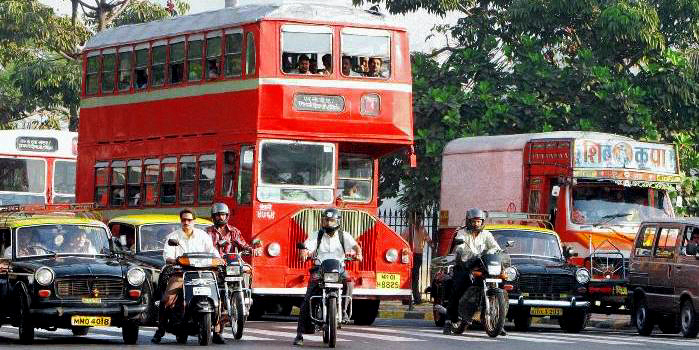 Although over 80% of Mumbai’s population use public transport, the city still struggles with congestion. A recent study by Barffour et al. (2012) highlighted the shortfalls in data maintained by the two main authorities on road safety in India, the Ministry of Road Transport and Highways (MORTH), and the National Crime Records Bureau (NCRB). Their study used the benchmark specified by the World Health Organization manual for comprehensive assessment of road safety data, and found that while national-level data was sufficiently available for outcome and exposure indicators, there was stark inadequacy for state-level data over all indicators. This raises an important question for micro-based public policy for road safety – the lack of useful data might be hindering objective assessment of road safety standards in India’s states and cities. Along similar guidelines, data from the Mumbai Traffic Police, and the Motor Transport Statistics of Maharashtra (2010-11) put out by the Maharashtra State Transport Department can be assessed to ascertain if monitoring and enforcement for a metropolitan area like Mumbai is supported by publicly accessible data. The availability of this data is of high utility to the cause of road safety mainly due to its potential effect on informing policy decisions. Using the same methodology as Barffour et al. (2012), this author finds that upon pooling two data sources for the city of Mumbai, several requirements of the WHO manual are met. While a formal analysis remains to be conducted, our overview tells us that both, the Mumbai Police’s Traffic Training Institute (Byculla) and the Motor Vehicles Department (Government of Maharashtra) maintain data to a great level of detail as specified in the guidelines for outcome and process/implementation indicators, as well as some detail on safety performance indicators. However, the major gap comes in the area of cost indicators, as there are no mentions of socio-economic costs of traffic congestions, injuries or other aspects of road accidents. The data obtained from the Traffic Training Institute, Byculla speaks volumes about the seriousness of road accidents and the role their frequency plays in road safety measures in the city. Month-wise data reports that were made available to EMBARQ India for a project on road safety, and detailed yearly data on the nature of road accidents in India were found to contain a number of road accidents over the years categorised by traffic divisions and police stations across Greater Mumbai. Furthermore, the ‘HSP Report’ comprised of several datasets that classified road accidents in Mumbai according to different characteristics. These included weather conditions, features of the road (i.e. width, surface material etc. ), accident-prone areas, highway classifications, and vehicle age, break-up of causes and classification of victims according to age group, gender and role in the accident. Considering the case for lack of data on cost indicators, it can be said that there is little estimation done by the Mumbai Traffic Police or the Regional Transport Authority, possibly due to lack of availability of information regarding scientific procedures for ascertaining the value of road accidents in monetary terms. The recommendation would then be to involve an organization, or academic expert to understand the economic and social costs sustained by increasing road traffic injuries and deaths. The social cost incurred due to road accidents is pegged at 3% of GDP by the Eleventh Five Year Plan (Planning Commission of India), although it does not provide any details on how the figure was estimated (9.3.81, Page 306). The State Transport Department may find it useful to assess the cost of congestion in a rapidly growing city like Mumbai, as it would guide the need for appropriate policies on registration of new motor vehicles and disbursements under road development funds. The Mumbai Traffic Police, by including such analysis in their reports can highlight the impact of road accidents to enhance enforcement norms. No assessment of data maintenance is complete without acknowledging the possibilities of biases in reporting and collection. Ambiguity over data verification processes raises queries regarding over-reporting or under-reporting of road accidents in the data, as there may be leakages while recording the First Information Report (FIR, standard recording document that is prepared at the time of the accident), as well as errors in coding the FIR correctly into useful data. This can be improved by ensuring standardized FIRs for reporting accidents, with stricter monitoring of data entry procedures. The need for reporting norms for data is paramount in this Decade of Action for Road Safety (United Nations), where without verified, comprehensive, and publicly accessible data, we may forego an opportunity to ascertain guidelines for optimum road safety in our urban areas. NOTE: The data obtained from Mumbai Traffic Police is not publicly available on their website, but can be obtained by filing a Right to Information claim at their Headquarters in Worli, Mumbai.